Perdido Sun is your place in the sun. From your own private, beach-front balcony you can enjoy spectacular beach views of the clear emerald waters and dazzling white sand. This 10th floor unit is beautifully furnished with Ceramic tile in Living Room, Dining Room, Kitchen, Baths and carpeted Bedroom. Electronics include 32” Flat screen TV, DVD, CD Player in Living Room and 26” TV, DVD in Bedroom. Absolutely beautiful property. Loved staying at Perdido Sun. Will need a larger unit next year, but would love to stay in same building again! Thanks so much. Loved how clean the condo was and loved that it was fully furnished. Called the office a couple of different times in hopes to stay longer and the ladies were always super friendly and helpful. Everyone was friendly and eager to help. We couldn't ask for a better group to assist us. In a word, it was perfect! The weather was great, the property was top notch and the winter residents; aka Snowbirds, were very friendly and made us feel welcome and at home. The indoor heated pool is a good asset during the winter months. This is about my 5th stay in this complex and I'm always happy with my choice. 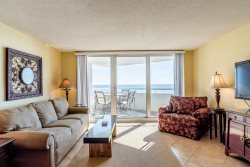 We've stayed at several others along Perdido Key and this one is at the top of our list. Excellent Service! Super clean unit as well as lobby area, grounds and pool. The unit was very clean when we arrived! Kitchen was well stocked with cooking needs. The bed was comfortable and the sheets were nice. We had a great stay! Love Perdido Sun and Perdido Realty.